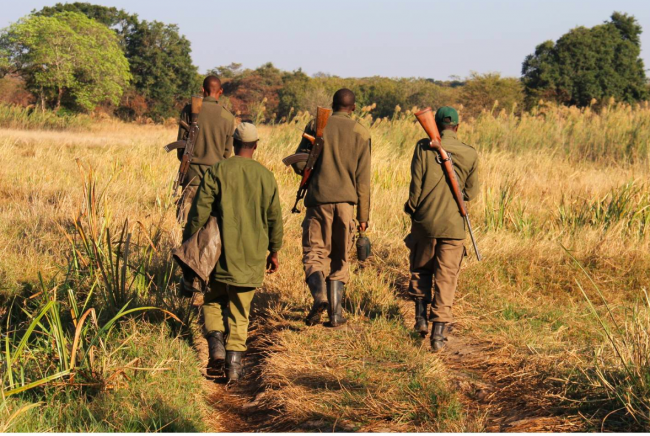 Zimbabwe Parks and Wildlife Management Authority (ZimParks) rangers have shot dead a Zambian man they suspected to be a poacher and injured his two accomplices in a shootout in Zambezi National Park in Victoria Falls. The bloody exchange happened on Sunday afternoon near the Zambezi River, according to Zimbabwean media. ZimParks spokesperson Tinashe Farawo confirmed th e incident, adding that the shootout involved five suspected poachers. The deceased has been identified as Patrick Nkane of Nyandu village in Zambia. “They were armed with .375 rifles, which we have recovered and four live rounds of ammunition. The injured poachers have been surrendered to the police and one of them is being treated at Victoria Falls Hospital under heavy guard, while the other one has been transferred to Mpilo [Central] Hospital in Bulawayo for further treatment,” he said. Over the past years, Zambian poachers have been targeting elephants in the game reserve. Last month, rangers recovered 13 tusks, a rifle, Zambian cellphones, dried elephant and buffalo meat at Hwange National Park after the group fled from rangers.